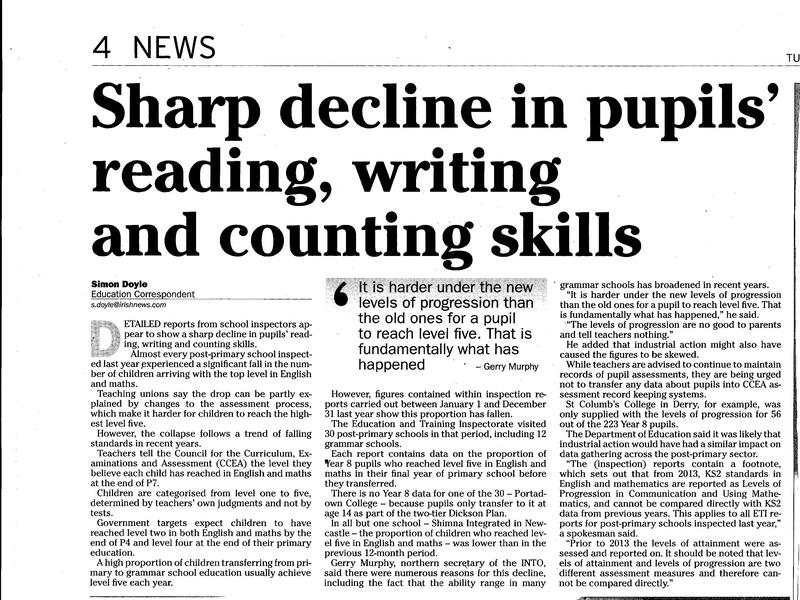 Some weeks ago the education correspondent of the Irish News splashed the following damning headline on its front page: Primary school maths and English levels plummeting. This serious accusation fits with a clear trend in the media’s approach to Northern Ireland’s schools. It would be difficult, if not impossible, to find a single media figure or politician prepared to praise our current education system. Every commentator seems to portray our schools as underperforming and reluctant to “share” even as they face into an epidemic of “empty desks.” Nothing could be further from the truth. There is little or no evidence offered in support of such claims and where evidence is offered – in the case of the Irish News article – it is based on what can only be described as misinformation. If we are to avoid headlines which damage our aim to attract much-needed inward investment, the fourth estate (and the teaching profession) must be more questioning of data emerging from CCEA and the Department of Education, even when that data has the endorsement of the Education and Training Inspectorate (ETI). Just as there is a media consensus for radical change in order to transform our schools in the name of “sharing,” I cannot recall any of our education correspondents (whether the medium be newspaper or television) ever departing from the consensus evaluation of the Northern Ireland curriculum. Work began on a Northern Ireland curriculum in the 1990s, with pupil attainment being reported for the first time in “levels.” One quarter of a century later and CCEA’s attempts to measure their cherished “cross-curricular skills” against the new levels of progression seem to have come to nothing. Attempt after attempt to design assessment instruments capable of measuring pupil attainment in the Northern Ireland curriculum ended in failure. Who remembers InCAS; NINA and NILA software; external assessment resources (EARs); common assessment instruments (CAIs); assessment units (AUs); and end-of-Key Stage tests? Why was no one tempted to trace this litany of failed assessment tools to the incoherence of the CCEA/DENI curriculum model? This reluctance to tell the truth about the curriculum could be explained by the fact that the two people (Gavin Boyd and Carmel Gallagher) who did most to visit this “Trojan horse” (Ms Gallagher’s term) on Northern Ireland’s young people are now appointed to powerful governing roles in education. In fact, Mr Boyd is the most influential figure in education administration. A further explanation for curriculum’s many deficiencies receiving scant publicity is that the Minister desperately needs this curriculum to make his case against grammar schools. Even at a time when large numbers of teachers and classroom assistants are about to lose their jobs, no union leader is suggesting that money be saved by simply dropping this poorly conceived education conceit. Every school in England which adopts Academy status can abandon the National Curriculum and move to the less onerous requirement that the school teach a “broad and balanced” curriculum. OFSTED reports indicate that, in general, standards rise when the curriculum straitjacket – with all its attendant bureaucracy – is cast off. In 1999 CCEA set in train a review of the Northern Ireland curriculum with the aim to “provide a curriculum and assessment framework which … has the confidence of teachers, pupils, parents, employers and the wider public.” In 2013 (a full decade and a half later) a comprehensive survey of all the schools in Northern Ireland found that between 82% and 89% of respondents regarded the curriculum’s levels of progression to be of limited or no use to: individual pupils in informing their on-going learning; teachers in informing their teaching; Boards of Governors in judging value-added to pupil learning; parents in understanding their child’s progress; receiving schools informing them what a pupil knows; ELBs to inform the support schools may need; ETI in understanding school value-added to pupils; and politicians in understanding system performance. Despite what can only be regarded as derision, the this expensive failure stays in place, even at a time when front-line staff are to lose their jobs. Furthermore, between 82% and 89% of teachers regarded the levels’ statements of attainment to be of limited or no use in informing: teacher judgement about pupils’ work; teacher feedback to pupils on next steps in learning; adjustments to teaching; and annual report to parents. Finally, the majority of respondents considered end-of Key Stage levels to be of limited or no reliability for (i) the class; (ii) their school; (iii) other schools; and (iv) the Northern Ireland system as a whole. A British Government investigation of levels-based measurement concluded that they have been “a distracting, over-generalised label giving misleading signals about the genuine attainment of pupils;” they were “clogging up the education system with undependable data on pupil attainment;” and they were “just too vague and imprecise.” The Irish News article gave the misleading impression that levels-based measurement could be used to draw valid inferences about the literacy and numeracy skills of our young people when, in fact, the newspaper was reporting misinformation. 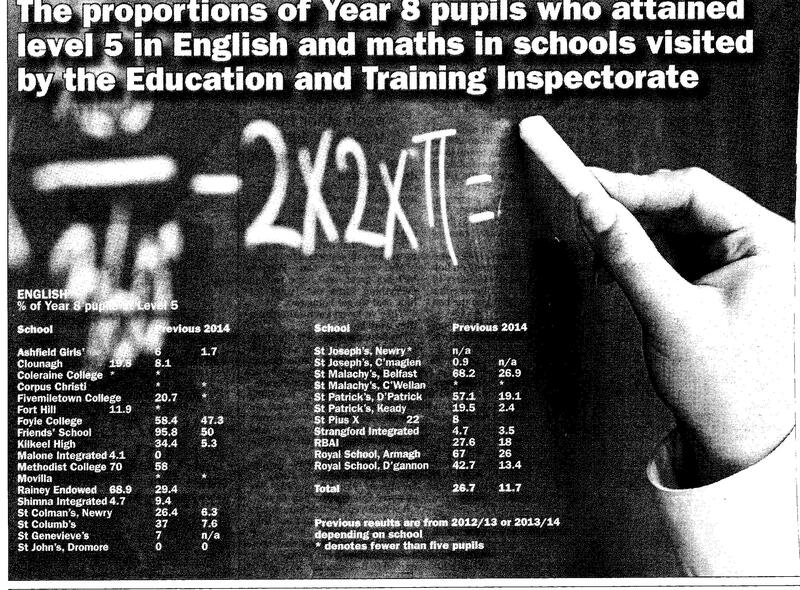 The signs were there from the very beginning that the Northern Ireland curriculum was an incoherent mess. Its “scientific basis” turned out to be plagued by a category error (see 2009 Oxford Review of Education, 35(1), pp. 99-109). A small group of individuals – allied to the National Grammar Schools Association (NGSA) expressed profound concern that the “constructivist” learning model on which the curriculum was founded would be damaging to the attainment of pupils from disadvantaged backgrounds. These concerns were raised with CCEA, the Department of Education, and Mr Haire the then Permanent Secretary in the Department. All to no avail. The evaluation of the so-called “Enriched Curriculum” validated the NGSA’s concerns. The evaluation report made reference to Stanovich’s “Matthew effect”: the rich were getting richer and the poor poorer! In her celebrated book The Academic Achievement Challenge, the Harvard academic Jeanne Chall studied 100 years of educational literature for any evidence that learning theories in which teachers transfer responsibility for learning to their pupils, advanced the attainment of pupils from deprived backgrounds. Study after study confirmed the negative impact of such methods on the life chances of children who live with disadvantage. The Irish News should make amends for the reputational damage done to our schools by calling for the immediate removal of the Northern Ireland curriculum, and the teaching unions should insist on its dismantling before any teacher or classroom assistant loses their job.